Moms crave time with their children, and they aren’t usually happy with just receiving a text, email or phone “check-in,” especially on Mother’s Day. In fact, more than one-third of parents (35%) with college-aged children prefer using video chat* to speak to their kids face-to-face. This year, Mother’s Day can be a starting point for your readers to get on board for regular “video visits” via Skype with one of the most important women in their lives and to make it easy for kids living away from home to visit their moms virtually over video, check out these downloadable “coupons” they can send for mom to cash in on throughout the year. Coupons are redeemable for a range of activities that can easily take place over Skype, from cooking together to learn mom’s secret recipes to working out together to a virtual breakfast in bed. 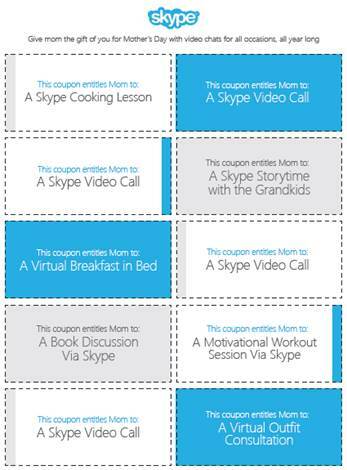 With Skype..you can give Mom more quality time! Credit: Skype. No compensation was received to post.